no one listens to me though. do you own headspeace gauges? do you even know what headspace is? You don't even know how to take apart the bolt, yet you think it's a good idea to go grinding on the part of your gun that holds in 50,000 psi of hot gas? still waiting on headspace guage huh? I played russian roulette and didn't die, so it must be safe, right? Yes it will change head space, will it change it to a dangerous level? I'll let you pull the trigger. That ring will not affect reloading the cases. I see no reason to remove the ring from the factory bolt for the sake of pretty brass. I suggest everyone just leave it alone. That step measures .008 in. Gunnysmith, the definitive awnser is appreciated. Just remember, if it closes on a no-go, the field gage is next. If it closes tightly on the field it will work. The brass will stretch with each firing. An annular ring will form near the head of the cartridge where the brass starts thin to out. I can't guess the number of firings one would get from the brass under these conditions. That would depend entirely upon how much excess headspace there is. Failure will be in the form of a head seperation. Gas escaping under high pressure, from the separation in the case, will damage the firearm, and very possibly the shooter as well. A very dangerous condition has been created. If you look here you will find 2 classic cases of head seperation. In the 57 pistol post one must realize the action of the FN 57 is a retarded blowback action. The casing adheres to the chamber wall for a short duration upon firing. This has been an acceptable and reliable type of action for many years. It does not however support reloading. The brass stretches on each firing. The brass is weakened severly and if reloaded can cause what was pictured in the thread. In the case of the FS 2000, the claim was an out of battery firing. Just seeing the pictures one realizes the case head is missing and was never found. The bolt on the rifle will not allow the pin to reach the primer until locked. Ask me how I know, I'll tell youI own two of them. The owner was using a mix of ammo and some of it was reloaded. The rifle was new or fairly new. There is no reason to believe the headspace was excessive. Upon firing, the round in the chamber seperated near the head. As described in the earlier post that gas is no longer contained within the case and escapes under very high pressure. The pictures show the result. Both shooters were very lucky in my opinion. That being said, always ask before performing any modifications on any firearm. If you don't get a satisfactory answer, there are many like myself with the experience, lerking on one or more of the boards. I was a practicing gunsmith from 1968 until quitting the industry in 1987. 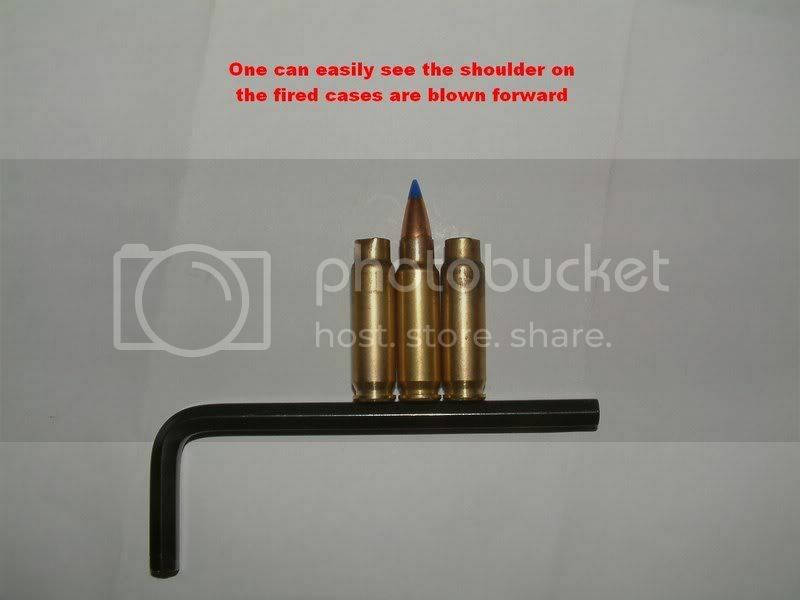 In the first photo it is easy to see the shoulder moved forward on both fired cases. This is a result of the retarded blowback action of both the PS 90 and the FN 57 pistol. Please understand, these are both fine firearms and are well designed, just remember using reloaded ammunition in each of the firearms is not supported by the manufacturer. The bolt mass of the PS 90 quit clearly retards the extraction phase of firing to a greater degree than the FN 57 pistol. The case from the pistol shows more ballooning at the shoulder. One can easily equate this, to firearms having excessive headspace. Anything other than that, requires attention to correcting the problem before reloading is acceptable. I would appreciate it if someone would get a headspace gauge and check out this mod...then post some definitive answers. This thread is not safe to have on this forum if this mod is potentially dangerous. Cobra, This is not a "Mod" , it is a critical dimension change. Actually, I think this thread is ESPECIALLY NECESSARY on this forum to CLEARLY STATE something that SHOULD NOT BE DONE!!! I am sure there are many others out there who have thought the very same thing, maybe some have even dont the change without even a clue as to the repercussions... This thread will serve as warning to those that have that question. Was edited to include further information. I just wanted to clarify for those who may not know the difference. Your expertize was never in question I assure you. santanatwo, I would like to thank you for this post in particular. I normally scan over such things and read them lightly. The way you posted raised the "Red Flag" Immediately. danger of such a change in critical dimension. My subsequent post are only because of your concern for the safety of your fellw shooters. Maybe a warning at the begining of the thread would not be a bad idea.? Thank You, Gunnysmith, your praise means a lot. 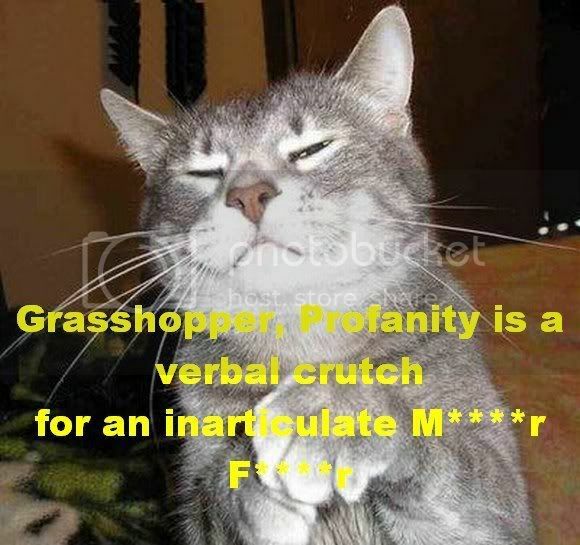 for the record I have a 20% warning for calling out a paying member (dumbass) for trying to sell an illegal SBR to unsuspecting members on the open forums. And for the record, nobody but the Staff here (and yourselves of course) can see all your warning levels. Santana2 and gunnysmith thanks for helping watch out for the noobies when they try to do stupid things. We are watching too but sometimes it takes us a while to get to the thread in question, with ALL the others we have to read through. It helps a lot when people use the report post to mod button. Santana if you had used that before, instead of taking it upon yourself to break the rules and troll in the for sale section, your warning level (<--------) would still be at zero. I noticed it on arfcom a while back, and when I saw that new thread in the 308 section, I was like OMG WTF BBQ, and thought to myself "I wonder if there is a report button?" Gunny, I'm totally confused. I want to start reloading for use in my saiga's (specifically .223 and later .308, & 7.62x39). I have a few questions but please bear with me. 1. Can I assume that in my relatively new saiga(bolts etc not f'ed with in anyway) rifles that my headspace is in spec for me to reload casings and fire reloaded rounds from this weapon? 1.1 Or do I need to have my headspace measured prior to reloading with a particular weapon? 2.2 Or should I try to install a buffer to prevent the ding from occurring? Sorry I'm such a newb to all this stuff, I just want to BE SAFE, and successfully reload for my weapons if possible. Allow me to provide another example. A few years back, I built a 'compliant' AK, using a name-brand US-made 'compliance' receiver, a 'compliance' fire control group, sufficient other 'compliance' parts to stay legal, and a low mileage AMD-65 kit with matching numbers. Not being a purist, I shortened a Bulgy gas tube (with HG retainers) so I could mount an upper hand guard (this was a common modification discussed over at The AKFiles at the time). Everything went together very nicely (it was not my first AK build, and I had built several FALs before I got interested in AKs). Everything seemed to function fine when cycling the action by hand. Took it to the range to function fire, and on the second round, it doubled (I had five rounds in the magazine - won't do that again). (3) Also potentially influencing the situation were a used (just slightly worn, but still used) parts kit, and the 'compliance' FCG (which, by the way, was also name-brand). Bottom line is this - one or more tiny changes produced a very big result. Who the heck would figure that swapping a gas tube could contribute to a potentially dangerous (even fatal) malfunction? Or that using 'compliance' parts from respected manufacturers could do the same? But add enough non-factory tolerances together, and it's entirely possible to get a non-factory result. All of which is why I love Saigas. The bolt/bolt carrier/receiver/etc. are all installed, head spaced & tested at the factory. Do I use 'compliance' parts for the FCG? Sure - but that's the only change to the mechanism, so there isn't the same potential for slightly 'out-of-spec' parts adding up to an accident. Moral of the story . . .
OK, excellent thread. Thanks, Indy, for linking to it. I've got a .223 Saiga on the way and was wondering what it did to the brass. I plan to reload for it....as I do for the half dozen other .223s that are kicking around here. 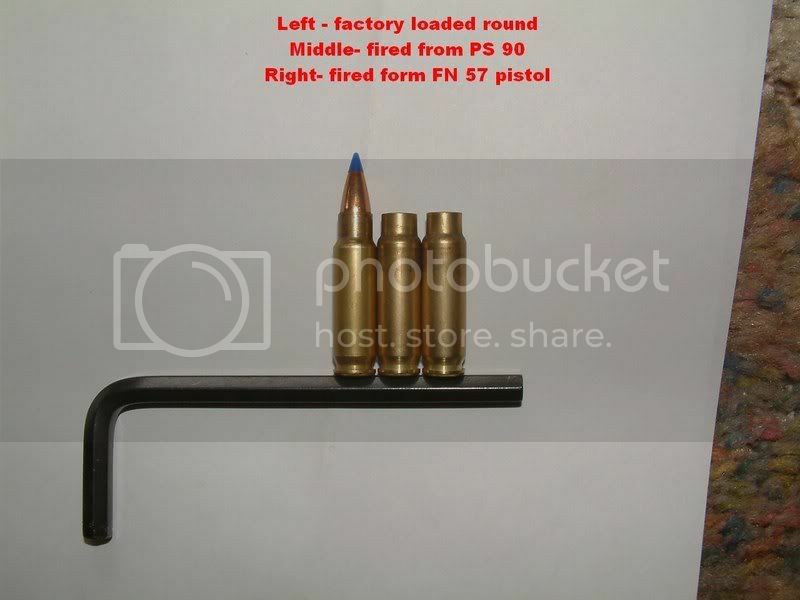 My question is whether brass fired in the .223 Saiga and reloaded (using a full-length resizing die) can be safely fired in my other U.S. made flat-breech-face .223s? If I were to alternate firing a case between the Saiga and my Remington 700, wouldn't the brass of the case head be worked excessively? It seems the Saiga bolt face would impress a dished-out area around the primer (or a ring around the outside of the case head) while the M700 would remove it. Is that right? After several firings (alternating between the two guns), could the case crack at the head or rim as a result? 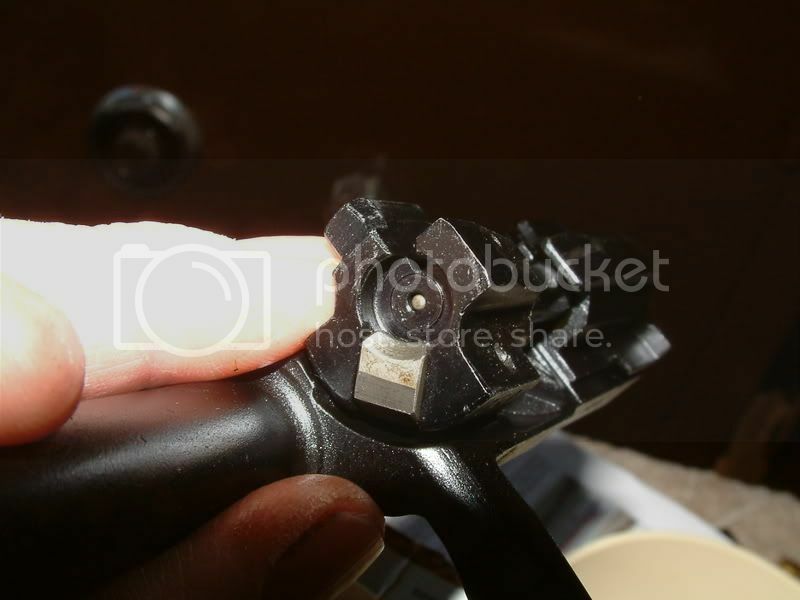 Would the case rim become so work-hardened that it could be torn off by the extractor? Is there any abnormal case-wall stretching going on when that ring is formed around the outside of the case head? It seems the safest approach would be to restrict brass fired in the Saiga to the Saiga for all subsequent firings. I've been reloading since the '70s. Got burned once by headspace thanks to an improperly made .223 resizing die. Ever since, I've been closely monitoring case length (shoulder datum-to-base) using the RCBS Precision Mic. Ain't gonna happen again. Gunnysmith, you listed dimension for match grade go and no-go gages. They differ quite a bit from Military and civilan go and no-go dimensions. Example The No-Go for Military .223 (which should be the same OUTSIDE dimesion as .223 Remington) lists it at 1.4706" Quite a bit differece from your example of 1.4696"
Ascertains correct headspace dimensions by duplicating the minimum allowable distance, from the case head (or boltface) to the datum line of the cartridge's shoulder, allowed within the chamber to secure a loaded cartridge and allow the breech to be closed in a safe manner for firing. If the firearm locks up in battery when the gage is inserted, then it is within acceptable minimum headspace dimensions and may be used. Duplicates the distance over the maximum allowable, from the case head (or boltface) to the datum line of the cartridge's shoulder, allowed within the chamber to secure a loaded cartridge and allow the breech to be closed in a safe manner for firing. If the firearm locks up in battery when the gage is inserted, then it is not within acceptable maximum headspace dimensions. The firearm should not be used and should be examined further by a knowledgeable gunsmith. Duplicates the maximum allowable distance, from the case head (or boltface) to the datum line of the cartridge's shoulder, allowed within the chamber to secure a loaded cartridge and allow the breech to be closed in a safe manner for firing. If the firearm locks up in battery when the gage is inserted, then it is at the maximum acceptable headspace and should be examined further by a knowledgeable gunsmith. Reference this link for some of the variances in headspace on the .223 or 5.56 NATO: http://www.ar15barrels.com/data/headspace.pdf It's a PDF link that anyone can download or print for reference. One other thought that came to mind when I was shooting reloads. On fresh, unfired, undinged-by-the-primer-raise brass, the headspace is good. I also had the headspace on mine checked at the local gunsmith with Go, No-Go, and Field headspace gages. However, the headspace gage is a solid piece of steel and measures whether the head space is correct on a closed chamber. Now, with once or twice fired brass your cartridge is no longer flat on the head near the primer. It is now indented and now fits into that button of raise material on the bolt face. Wouldn't the headspace be off NOW that the brass is now fired and has been re-shaped? It would presumably get no worse, as the brass is now about as deep as it's going to get. Point is, that on any other rifle, the headspace is the WHOLE cartridge head, not just that raised portion near the center. That center is taking all the pressure and all the recoil until it smashes in and then the outer part can take some of the pressure. The slight ding on the side looks insignificant to the pressure build at around the primer. Also, because the primer area is now recessed, it is most difficult to determine if the round is nearing excessive pressures, as one of the tell tale signs is flattened primers and no rounding on the edges. With this system they are ALL flattened. Only non fired brass still would show a true pressure indicator from the spent primer.